New York City is known for its tall buildings, financial markets and centers for the arts. But America’s most populated city is becoming known for something you might not expect -- farms. New York City’s government announced last month that it is providing $500,000 to create two urban farms. Both will use space in New York public housing developments. The new farms will join four other farms already operating with city government help. The idea is to get more fresh fruits and vegetables to communities in the city. City officials see it as a public health issue. “These new urban farms will not only provide access to healthy produce, but also provide jobs to young residents,” said New York City Councilman Ritchie Torres. The new farms will be in the New York City boroughs of Staten Island and the Bronx. Farming businesses in the city? These farms are supported by the local government. But, there are also privately run farms in the city. In the New City neighborhood of Tribeca, Robert Laing has opened up a privately-run indoor farm called Farm.One. He grows many kinds of herbs. His customers include well-known restaurants in New York City. The restaurants can pick up fresh herbs hours before they are needed for that night’s dinner because his “farm” can be reached by bicycle from much of the city. Laing's website tells customers that they can buy fresh herbs, even in a snowstorm. Farm.One is very different than farms in less populated communities. The major difference is size. It is only 112-meters. The U.S. Department of Agriculture says the average farm in America is 176 Hectares. 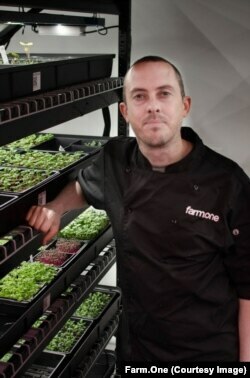 Farm.One’s crops are grown on vertical shelves so more can be grown in less space. Urban farms are growing in other cities besides New York City. The website Inhabitat.com recently released a list of the top four U.S. cities for urban farms. They are Austin, Texas; Boston, Massachusetts; Cleveland, Ohio and Detroit, Michigan. The Johns Hopkins Center for a Livable Future released a report on urban farms in 2016. It said there are important benefits to turning unused land into sources of healthy food. But it said that urban farming still has a long way to go to produce the environmental and health benefits claimed by supporters. “In some cases, the enthusiasm is ahead of the evidence,” the Johns Hopkins research said. For example, the report said that supporters of growing food close to the people who eat it claim that it reduces pollution compared to transporting food long distances. But the researchers found that smaller farms do not do as a good a job as larger farms in reducing use of water and other natural resources. The Foundation for Food and Agriculture Research based in Washington D.C. wants more urban farms. It said the benefits are almost unlimited. The group announced last month that it will give $2 million to help pay for a new farm in Newark, New Jersey, just outside of New York City. Aero Farms will work with scientists from Cornell University in New York State and Rutgers University in New Jersey. The goal is to grow salad greens with improved taste and color. The funding announcement said that because the farm is indoors the farmers can control the environment, including temperature, to improve their crops. Sally Rockey is executive director of the Foundation for Food and Agriculture. Brian Massey writes and farms. He recently wrote about managing an urban farm in a Washington D.C. neighborhood near Howard University. His report appeared on the website, civileats.com. He said that a lot of people liked the fresh fruit and vegetables his farm produced. But he said others worried the farm was there to help the newly arrived, wealthier residents, not the poor. There was a concern that the farm would add to Washington’s continuing shortage of low-income housing, Massey wrote. We want to hear from you. Write to us in the Comments Section and share your views on our Facebook Page. Are there farms near where you live? Do you think your community could support a farm?